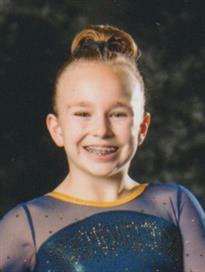 I first got into gymnastics in 2011 at age 5, when I joined Elko Gymnastics Club in Elko, Nevada. My very first competition was in December 2012 at the Teddy Bear Classic in Boise, Idaho, where I placed 3rd overall in my level. In summer 2013, I began advanced training, which has helped get me to where I am today. It's been my privilege to have worked alongside some very talented Elite gymnasts under the instruction of terrific coaches and national staff members over the years. Each of those people has taught me something important, positive and valuable that I can apply to my gymnastics performance and my personal life. I work hard to do a little bit better each day. I'm learning that it takes a long time to become a really good gymnast like the ones I look up to, so I try to focus on things one day at a time and try to perform better than I did the day before. Now that I'm at Level 10, I'm working to improve my skills and form in hopes that I'll be recruited by a top college team when I graduate from high school. I'm also training toward an Elite path. I know that will take a lot of hard work and patience, but with the help of my family and my coaches, I think I have a good shot at becoming an Elite gymnast someday. That keeps me excited about the years ahead and makes me want to keep doing my best in training and competition. I was chosen for the 2015 And 2016 USAG TOPs teams, and in 2016 I took 2nd place in physical abilities at the TOPs A-Team camp. I passed Elite compulsory qualification and am working on my skills to pass HOPES/Elite optionals qualification. I'm currently learning and refining my Level-10 skills on everything - bars, beam, floor and vault. Some are more challenging for me to master than others, but I'll keep working until I get them as close to perfect as I can. Competitions are a great way for me to see where I am, compared to where I should be at my level, so I learn a lot at meets - from judges and other gymnasts. At gym, I like to do back walkovers, aerials, giants, beam and floor. Away from gym, I enjoy family time with my mom and dad, my dogs "Beams" and "Barnum," riding my hover board, swimming, dancing, hiking, animals, fruit smoothies, frozen yogurt, Boba teas, Escape Room, and playing board games with my dad. I also enjoy school a lot. One of my favorite camps was Karolyi's Camp at Karolyi Ranch in Texas, where the US Gymnastics Training Center used to be. I went there for the first time in summer 2013. I made lots of friends, especially with the guest coaches and athletes helping the campers. I also won three awards - "Camper of the Day," "Most Improved," and "Rope Climb." I got to meet Bela and Martha Karolyi, and Bela asked me to show my rope climbing skills to the campers and parents during closing ceremonies on the last day of camp. Bela and Martha encouraged me to stick with the sport and consider trying to become an Elite gymnast. I'll never forget that experience!!! It was exciting to go back there in 2015 as a National TOPs qualifier and then be selected for the TOPs B team. It was even more exciting to return in 2016 as a TOPs A Team member.